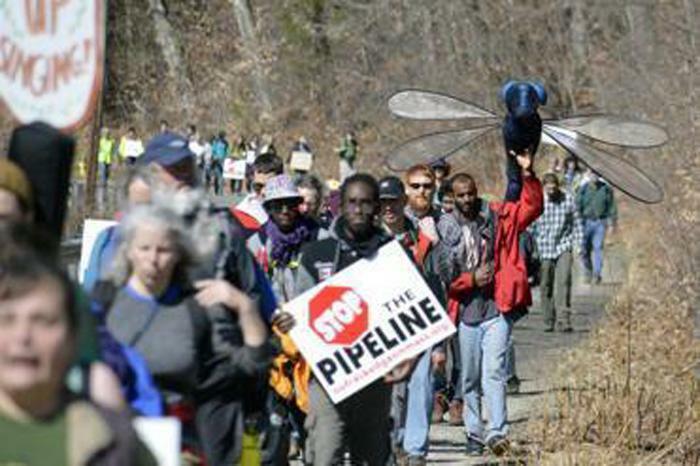 Protesters marched in Cummington on March 17 against the Kinder Morgan natural gas pipeline proposed for Western Massachusetts. The company’s withdrawal represents a huge victory for its array of opponents, ranging from grass-roots organizations to established environmental groups to powerful politicians. They also included residents of the many towns that would be affected by pipeline construction and activists who worried it could make New England overly dependent on natural gas. And the decision could provide a big boost to the other large pipeline construction project proposed for New England, Spectra Energy Partners’ Access Northeast, which has the financial backing of utilities Eversource Energy and National Grid. “There was probably room for only one of the two competing projects,” said Paul Flemming, director at ESAI Power, a research and consulting firm in Wakefield. Kinder Morgan had submitted plans for the project to federal regulators in November, and needed their approval before starting construction. That change, driven by Governor Charlie Baker’s administration and top officials in other states, is aimed at curbing New England’s relatively high electricity rates by bringing in cheaper natural gas to fuel power plants. Their theory: The cost of pipeline construction would be more than offset by savings in electric rates because more cheap gas could flow from Pennsylvania’s Marcellus Shale. Roughly half of New England’s electricity comes from natural gas power plants. One of the main risks the company cited: It’s far from certain that New England states will succeed in establishing rules that would allow electricity customers to be charged for gas pipelines. In Massachusetts, the Department of Public Utilities last fall approved rules to allow electric ratepayers to be charged for pipeline expansion, to ease supply constraints in the region. National Grid then sought state approval to charge electric ratepayers for the Kinder Morgan and Spectra projects, while Eversource wants to do so for the Spectra project. But the Conservation Law Foundation appealed the DPU decision, and the case is scheduled to be heard by the state Supreme Judicial Court on May 5. Kinder Morgan’s statement hinted at the uncertainty caused by the legal challenge, but didn’t mention the project’s many opponents. State Senate President Stanley C. Rosenberg, one of a number of Western Massachusetts officials who opposed the project, called Kinder Morgan’s decision a “game changer” that will simplify the broader discussion about how to meet the state’s energy needs. Lawmakers are expected to soon debate an energy bill that is likely to focus on attracting more hydropower from Canada and spurring construction of offshore windmills in waters south of Massachusetts. But politicians in Western Massachusetts, the area of the state that would have been most affected by Kinder Morgan’s project, weren’t the only ones to raise concerns. Meanwhile, US Senator Edward Markey praised Kinder Morgan’s suspension, saying the pipeline could have turned New England into a “throughway to export US gas to overseas markets” without benefitting residents here, by sending the gas to Canada for export. While environmental activists celebrated on Wednesday, they said their sights remain on the Spectra project.